Note: See Part 1, Part 2 and Part 3 for flight conditions, and important background information. 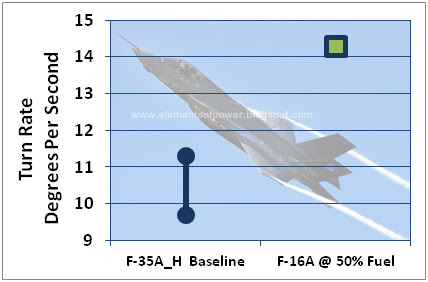 In the chart above we find, the F-35A_H baseline shows the possible ‘high , ‘low’ and range in between of possible values compared to the much-vaunted F-16A’s performance. 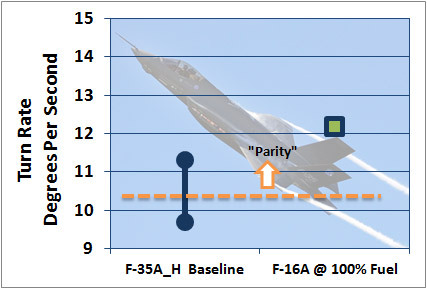 Clearly, the F-16A configuration's sustained turn performance, even compared to the best possible F-35A_H turn rate at 'spec' weight, goes beyond 'Superior' and approaches the level of 'Dominance'. This indicates it would be pretty stupid for an F-35 driver to get in a protracted turning fight with an F-16A if each combatant needed to get behind the other to 'get the kill'. But what about a turning fight when the F-35A_H weight is at other likely F-35A_H values? 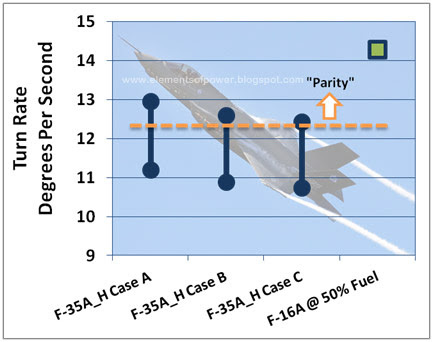 Thus we can see that 30-40% of the possible values for the F-35A_H in Case A (50% Fuel Load) would place the F-35A_H in relative parity (less than 2 Degrees/Sec, see part 2) with the F-16A, and there are fewer, but still ‘some’ possible values for Cases B and C that would also make the F-35A_H in ‘parity’ with the F-16A. 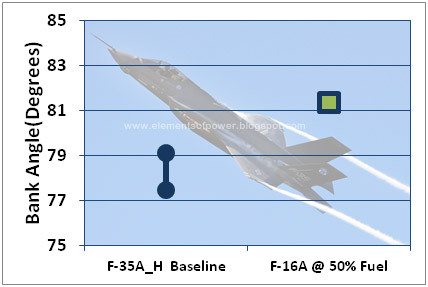 Obviously from what we’ve seen so far, the lighter the fuel load, more likely the F-35A_H could be on a par with the lightly loaded F-16A when it comes to sustained turn performance. A full internal fuel load, even with our ‘light’ F-16A weapons load brings the sustained turn rate performance of the F-16A down significantly. What if our ‘Spec’ loaded F-35A_H was compared to the an “F-16A-like” aircraft carrying full internal fuel. Envision the “F-16A-like” aircraft had just jettisoned its external fuel tanks to do combat with our F-35A_H carrying 60% internal (and total) fuel. 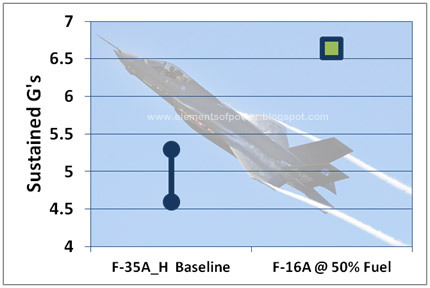 Over half (~2/3rds) of the possible sustained turn rates for our F-35A_H Baseline aircraft are on a par with an F-16A carrying a full internal fuel load. 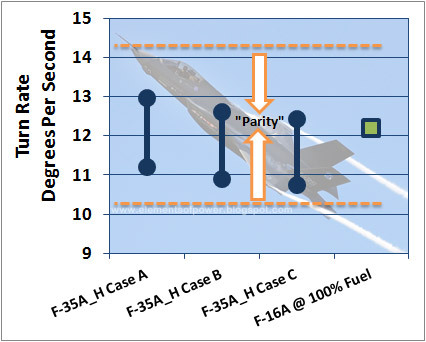 From this chart we see that ALL possible sustained turn rate values for the F-35A_H using any of the three selected fuel load cases are on a par with our ‘full internal fuel load’ F-16A. Depending on amount of fuel carried by each aircraft, the F-35A is capable of sustained turn performance on a par with the F-16A. Assuming the F-16A is still the ‘best’ in a sustained turn that there’s ever been at 15K feet and M.8, then that means the F-35A is capable of holding its own against all comers in a sustained turn when flown properly in competent hands. This would be a lot more exciting news if Sustained Turn Rates were still as important today as they were before the advent of the All-Aspect missile attack. I wonder what technical performance metric the critics will criticize next? Why This Topic and Why Now? The impetus for this mini-series of posts springs from all the things that seemed to be hitting the headlines while I was out having a life (of sorts) away from the web. Things like the usual POGO Clown Posse faux alarm protestations that arose in response to the recent F-35 performance spec changes: Protestations that were then flung like monkey-you-know-what by the usual suspects for consumption by the innumerate and ill-informed around the globe. Further, once industry and defense pilots who’ve actually, y’ know, FLOWN one or more of the three F-35 versions-- probably in response to the flingin’—got a little vocal with positive comments on the F-35’s maneuverability, the ‘Anti’ crowd and business scavengers went DEFCON1 trying to drown them out. I see the next couple of years as make or break for the F-35….critics. The number of F-35 pilots will reach critical mass in this timeframe, and the Anti-JSF'ers know that once that happens, unless the plane really IS a bust, no amount of hyperbole and lying coming from POGO and its fellow travelers will be able to sustain a false 'image of failure' for the F-35. The increasing desperation of the anti-defense, anti-JSF action-network is palpable…and delicious. But their outrageous claims must still be contested with facts, and their Misleading Vividness must be undone by sober observations. They must be contested lest their deceptions gain any real traction or (equally undesirable), their deceptions provide cover to others who would kill the F-35 for their own evil, or more likely, ignorant and misguided motives who would use the F-35 misinformation as a useful tool. What Next on the F-35 Front? With the F-35 numbers in the field climbing, expect the ‘Reform’ types to focus on generating “Cost! Cost! Cost!” misconceptions more than on technical performance topics. It doesn't mean every little glitch won’t get a snarky article posted someplace in the manner of targets of opportunity, but that won’t be their primary focus.